It’s a staggering statistic, but the CDC estimates that 110 Americans die every day due to opioid overdose. That’s like a Boeing 717 going down every day in America with no survivors. Can you imagine the daily news report stating that another 110 people died on an aircraft EVERY morning? If so, there would be a scramble by state and local government agencies along with plane manufacturers and airlines all working together to stop this cycle. But what is the answer to ending the cycle of opioid misuse and abuse? What is an opioid? According to the National Institutes of Health, opioids are a class of drugs that include the illegal drug heroin, synthetic opioids such as fentanyl, and pain relievers available legally by prescription, such as oxycodone (OxyContin®), hydrocodone (Vicodin®), codeine, morphine, and many others. These legal opioids were designed to help curb pain for those with acute symptoms generally in conjunction with a surgery or injury. And, many pharmaceutical companies initially assured physicians that there was a minimal risk for addiction. 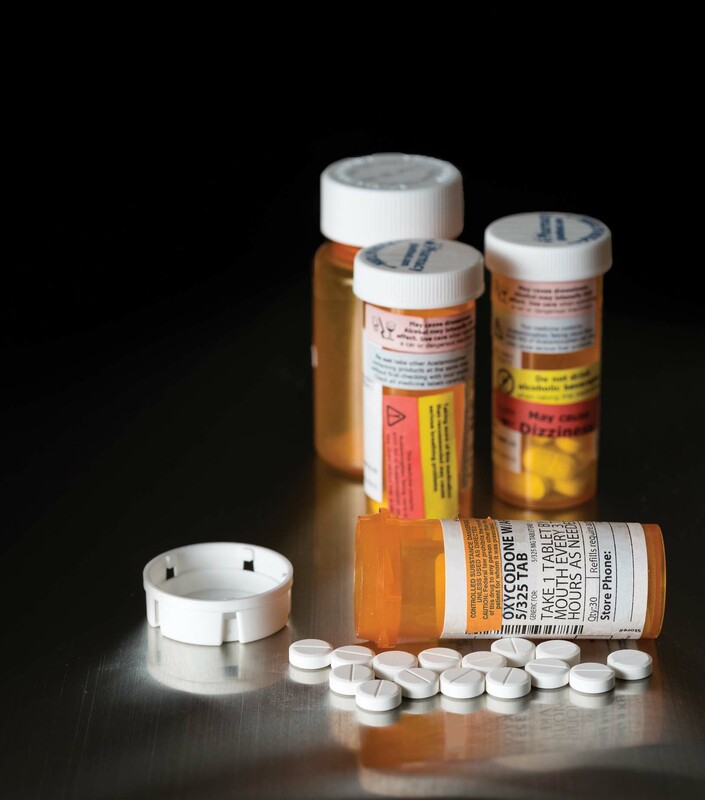 Time has demonstrated, however, that there is a high risk for addiction with roughly 21-29 percent of patients reporting misuse of their prescriptions. We are often asked what are some signs and symptoms to look for if you’re concerned about a loved one. Drowsiness, change in sleep habits, loss of relationships, a need for secrecy, and inability to concentrate are all general signs of someone with a substance abuse issue. Most specifically to opioid addictions can include flu-like symptoms. Nausea, fever, and headaches can be signs of withdrawal. An opioid overdose can cause sudden death. One of the biggest warning signs is slowed breathing. If you suspect your loved one has overdosed, call 911 immediately. Legal opioids are a problem. While many physicians prescribe opioid pain relievers to help relieve pain associated with surgery or injury, patients should know the risks associated with these medications. It is extremely important that these drugs be taken as directed. However, tolerance and physical dependence are two possible side effects. Constipation, nausea, vomiting, sleepiness, dizziness, confusion and depression are all side effects to consider and discuss with your healthcare professional. In addition to understanding the risks and warning signs of opioid misuse and abuse, it is important for anyone with medications in their homes to be responsible. First, if you keep medications in your home for regular use, keep an inventory. Regularly count the medications to make sure that none are missing or disappearing. Second, if there are medications in your home that are expired or no longer needed, get rid of them! If you’re a parent, please talk to your kids. It’s important to keep them safe by safeguarding the medications in your home. But, there are so many threats that exist outside your house. Your kids need to know the risks of misusing or abusing prescription drugs — and the potentially deadly impact one decision can have. Illegal opioids exacerbate the problem. Often once someone becomes addicted to legal opioids, they struggle to balance the costs and requirements of legitimately prescribed opioids and turn to heroin. The NIH says, in fact, that roughly 80 percent of current heroin users began as prescription opioid users. According the Drug Enforcement Administration, the average street value of a tablet of Hydrocodone (depending on dosage and region) is $5-7 per tablet and Oxycontin 80mg is $80 per tablet. Heroin, however, costs roughly $5-10 per bag. This cycle has perpetuated the heroin problem across the US. In fact, heroin overdoses more than tripled from 2010-2014 (National Center for Health Statistics, CDC). Here’s the critical question to be asked – how do we stop this epidemic? How do we keep 110 mothers, fathers, uncles, sisters, and children from dying each day? Here are some suggestions. First, strategize and set goals when it comes to pain management. Have an open and frank dialogue with your healthcare provider about how best to manage pain – using the least addictive methods first. Set goals for pain management and evaluate regularly. Explore alternative pain management options if at all possible. Second, be cognizant of the medications in your home and who might have access to those. Monitor all regular medications and take regular inventory. Utilize Medication Take Backs, Permanent Drop Boxes, or Medication Disposal Pouches to regularly dispose of expired or unused medications. Third, talk about it. The more we hide the problem, the worse it will get. Talk to your kids – set expectations for how prescription medications are to be handled in your home. Talk to your neighbors and talk to your friends. We all have a role to play when it comes to changing the cycle of opioid abuse. Fourth, get involved. The Bay Area Alliance for Youth & Families is actively working on projects to help protect our kids, our most valuable assets as a community, by addressing this problem head-on. They invite you to be part of what they’re doing in the Bay Area to stop this epidemic. Join them! « Miss Kemah Pageant, Simply Amazin’!